Highly Detailed artists impression of the large artwork as shown above on the back and the front of thisTee. The artwork is of the Pontiac GTO family introduced by GM, celebrating Purely Righteous Muscle! Brilliant colours and the highest of details will grab your attention with these goats here folks. The artwork on the front of the Tee is of a selection of first generation GTO’s at the drags, or parked up in the public carpark, or even being chased by the local constabulary. The first in the foreground is this fine example being the Red 1966, 6.5 litre, XS engine optioned, factory Ram Air set up with new 744 high lift cam, powered hardtop beast. Classic Red wall tyres on factory Rallye rims and that menacing front grille arrangement just makes this goat a beautiful ‘sleeper’! Pontiac's intermediate line was restyled again for 1966, gaining more curvaceous styling with kicked-up rear fender lines for a "Coke-bottle" look, and a slightly "tunneled" backlight. The tail light featured a rare louvered cover, only seen on the GTO. Overall length grew only fractionally, to 206.4 inches (524 cm), still on a 115 inch (292 cm) wheelbase, while width expanded to 74.4 inches (189 cm). Rear track increased one inch (2.5 cm). Overall weight remained about the same. The GTO became a separate model series, rather than an optional performance package, with unique grille and tail lights, available as a pillared sports coupe, a hardtop sans pillars, or a convertible. The background scene to the Red ’66, illustrates a parked up Black ’66 GTO rag top with Red wall tyres and factory polished spoker mag wheels. Let’s not forget the car chase in this back ground of this scene, how cool is this! Police spec ’65 sedan chasing a Yellow ’65 Rag Top! Further North of this fabulous artwork on the front of the Tee, and proudly parked is this beautiful ’65 GTO in Teal finish with “subtle” tubbing of the rear end to fit those oversized Mickey Thompson Sportsman race tyres, and ‘show wheels’ 5 spoker polished mags! The Tempest line, including the GTO, was restyled for the 1965 model year, adding 3.1 inches (79 mm) to the overall length while retaining the same wheelbase and interior dimensions. It sported Pontiac's characteristic vertically stacked quad headlights. Overall weight increased about 100 pounds (45 kg). Brake lining area increased nearly 15%. Heavy-duty shocks were standard, as was a front antisway bar. The dashboard design was improved, and an optional rally gauge cluster ($86.08) added a more legible tachometer and oil pressure gauge. The 389 engines received revised cylinder heads with re-cored intake passages, improving breathing. Rated power increased to 335 hp (250 kW) at 5,000 rpm for the base 4—barrel engine; the Tri-Power was rated 360 hp (270 kW) at 5,200 rpm. The Tri-Power engine had slightly less torque than the base engine 424 lb·ft (575 N·m) at 3,600 rpm versus 431 lb·ft (584 N·m) at 3,200 rpm. Transmission and axle ratio choices remained the same. The three-speed manual was standard, while a four-speed manual or two-speed automatic were optional. The restyled GTO had a new simulated hood scoop. A rare, dealer-installed option was a metal underhood pan and gaskets to open the scoop, making it a cold air intake. The scoop was low enough that its effectiveness was questionable (it was unlikely to pick up anything but boundary layer air), but it allowed more of the engine's roar to escape. Lastly, finishing up the artwork on the front is this ’64 GTO in the staging lane, gettin’ ready to rumble down the ¼ mile. Beautifully presented in standard trim, who cares if the owner wants to see how quick she’ll run! 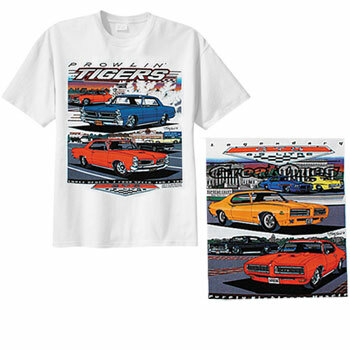 Brilliant drag raceway background scene adorns the top artwork on the front of this t-shirt. Ok, so what’s on the back of the T-shirt then? On the rear of this Tee, we have this fabulous artwork of Judges corner. Yes folks, in Washington DC is where you will find our Judges in the Supreme Court. We’re talking second generation Judge GTO’s here people. Lining up in the foreground we have this magnificent Red ’68 GTO with ‘hide-away’ head lights and it’s unique feature of the body-color Endura front bumper. It was designed to absorb impact without permanent deformation at low speeds. Right beside the Red ’68 is a ‘raked and slammed’ pro-street ride, ’67 GTO hardtop. Black panels on this beauty are ‘gun-barrel’ straight! Lastly, we have the final three Judges awaiting to deliver the verdict. Firstly, this fine ’69 Judge GTO in all it’s factory glory, just gorgeous. This baby included the Ram Air III engine, Rally II wheels without trim rings, Hurst shifter (with a unique T-shaped handle), wider tires, various decals, and a rear spoiler. Pontiac claimed that the spoiler had some functional effect at higher speeds, producing a small but measurable down force, but it was of little value at legal speeds except for style. The Judge was initially offered only in "Carousel Red," but midway into the model year a variety of other colors became available. Of these other colors, a "Ram Air IV Judge Hardtop" painted in Crystal Turquoise with a black interior is the most rare. Enter the Judge for 1971. These two ‘pro-street’ style beauties still retain their factory muscle ‘livery’. The 1971 GTO had another modest facelift, this time with wire-mesh grilles, horizontal bumper bars on either side of the grille opening, more closely spaced headlamps, and a new hood with the dual scoops relocated to the leading edge, not far above the grille. Overall length grew slightly to 203.3 inches (516 cm). The top GTO engine for 1971 was the new 455 HO with 8.4 compression, rated at 335 hp (250 kW) at 4,800 rpm and 480 lb·ft (651 N·m) at 3,600 rpm. It had 310 hp (230 kW) SAE net at 4,400 rpm in the GTO and 305 hp (227 kW) SAE net in the Firebird Trans Am or Formula 455 with air induction. Tee shirt Colour: Available in White only, with genuine GM Official Licensed Product Tag.